Synthetic Sheepskin Pad, 30" x 60"
Deluxe Natural Sheepskin - 36" x 36"
Pad measure 78" x 34"
The Med Aire Variable Pressure Pump and Pad is made for distributing pressure points helps alleviate bed sores and other discomforts associated with constant pressure on the skin. This pad measure 78" x 34" and features a whisper quiet pump. It can safely support anyone up to 250 pounds and do wonders to increase circulation and reduce the incidence of decubitus ulcers. Comes in either standard or deluxe. Standard lays on top of your mattress, deluxe has flaps that help hold the pad securely in place. by Whippsx from Fort Lee, N.J.
Good Support. Comfortable. Easy To Assemble. Durable. My mother has been bedridden for over a year and thanks to this air mattress, she has not gotten any bedsores. I highly recommend it! Durable. Good Support. Comfortable. Easy To Assemble. Durable. Good Support. Comfortable. Easy To Assemble. quality product. Well made and does what it is supposed to. Great for support and comfort. I have several patients on these mattresses and the air pads can certainly not be expected to last forever. I need to be able to order replacement air pads to be used with a still functional air pump. Any ideas? is the variable function manual only, or does the pressure change cycle through the pump? What is the inflated height? Curious if they make these in a chair size? Taking a long road trip and it would be wonderful if there is such a product. It is the same as to turn the patient without it. It accommodates a regular or extra long twin bed. How difficult is it to turn the patient if they are in the bed 95% of time? Does the patient sink into the pad, making turning more difficult? The air overlay does not interfere with turning a person in the bed. However, not a good idea to lie someone directly on any vinyl or plastic material, so I put a foam eggcrate pad overtop. FYI, I am the primary caregiver for a family member who is bedridden from a stroke. King size but only want to use the Pressure Pump on one size of the bed. I want to know what the end flaps are for? This will be used by me to help with pressure points and nerve pain from a spinal disease. DOES IT WORK IF HOSPITAL BED HEAD & FOOT ARE ELEVATED?DOES IT HAVE TO BE FLAT? I don't have the answer, but am very interested in the answer. the pad works no matter what the angle of the knee break or the head of the bed elevation. These pads really provide good, affordable skin protection from pressure wounds. Much better than eggcrates or gel pads which are both worthless for preventing pressure wounds on a non moving patient. My mother used this mattress for 5 years GREAT! It works perfect no matter what position the bed is in. we're wondering if the bed pad is also waterproof? will it accommodate a regular full size bed? No. 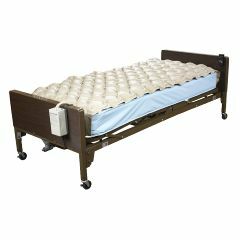 The size it is covers a hospital twin/single-sized bed. What is the warranty on this air mattress?